It doesn’t get much better than deliciously cheesy spinach dip stuffed inside warm french bread! These Individual Spinach Dip Bread Bowls make great party food and holiday appetizers! Just make a large enough batch because they are irresistible! 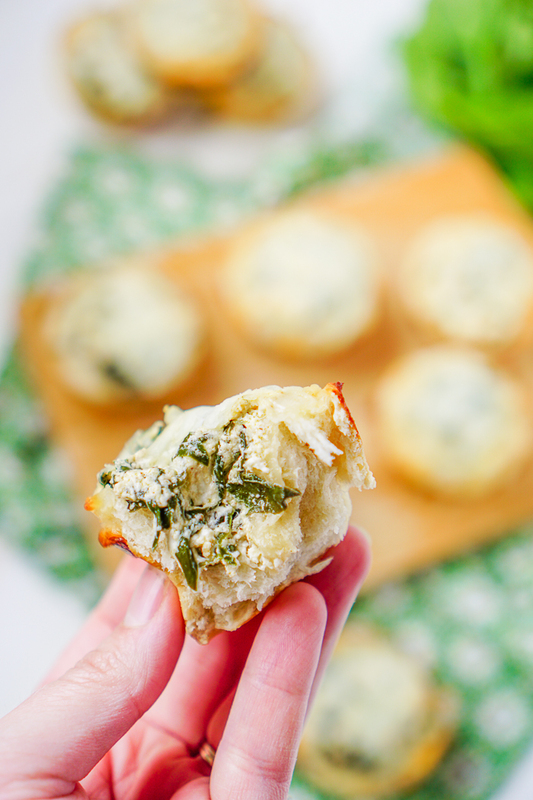 Cheesy, Warm Mini Spinach Dip Bread Bowls that Make the Perfect Bite Sized Appetizer! 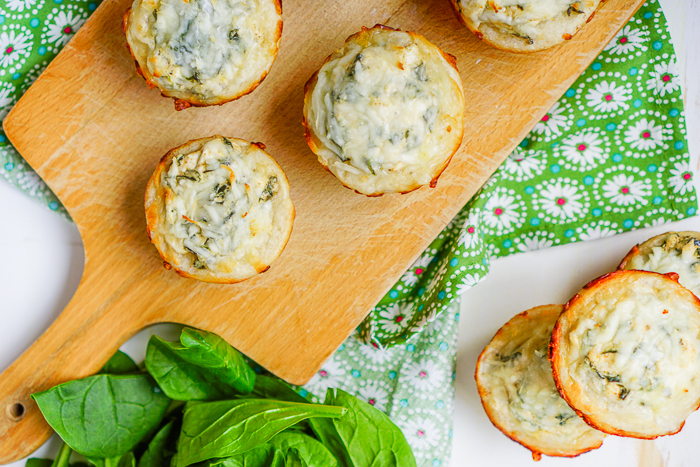 These mini spinach dip bread bowls definitely make the list of Bryan’s top 5 snack food recipes I make! In fact, he would eat the whole pan of them if I’d let him, which I don’t because then there wouldn’t be any for me and this girl is a carb-oholic! The warm french bread bread bowls are warm with a sightly toasted outside and filled with cheesy spinach dip goodness. It’s a winning combination! The reason these mini bread bowls make my favorite party food recipes list is because they are easy to prep. The spinach dip filling comes together easily with only a quick sauté of the spinach and garlic needed before mixing it quickly together with the other ingredients. Then, I use a can of french bread for the bread bowls which is tasty but more importantly for my life – fast! The first time I ever made this recipe was way back in Bryan’s small grad school apartment for birthday celebrations. Bryan and I were born only 5 days apart (I’m finally NOT the youngest in my family!) so we like trying to get our friends together for a fun birthday week celebration. I didn’t want to be making anything big or complicated where I’d need to spend the whole party in the kitchen, especially since we were celebrating my birthday, too, so we decided to do a full appetizer menu! Individual Spinach Dip Bread Bowls quickly became the main attraction! They’re a bit more filling then your normal spinach dip recipe, which is perfect for a day of grazing. You’ll definitely want to give these a try as game day food, Christmas appetizers, New Year’s Eve party food, or even just lunch! Bryan and I may or may not have enjoyed these for lunch! Let your french bread loaf sit out on the counter for a little bit before trying to work with it. If it’s closer to room temperature, you will have an easier time manipulating it to do what you want. When you’re ready, make sure to spray each muffin cup with cooking spray to avoid having a sticky mess. Unroll your french bread load and slice into 10 equal slices. Flatten each one into about a 3″ round pancake by pressing between your hands and lightly pulling. Push each circle into their individual cup, pushing them to form the shape of the cup. 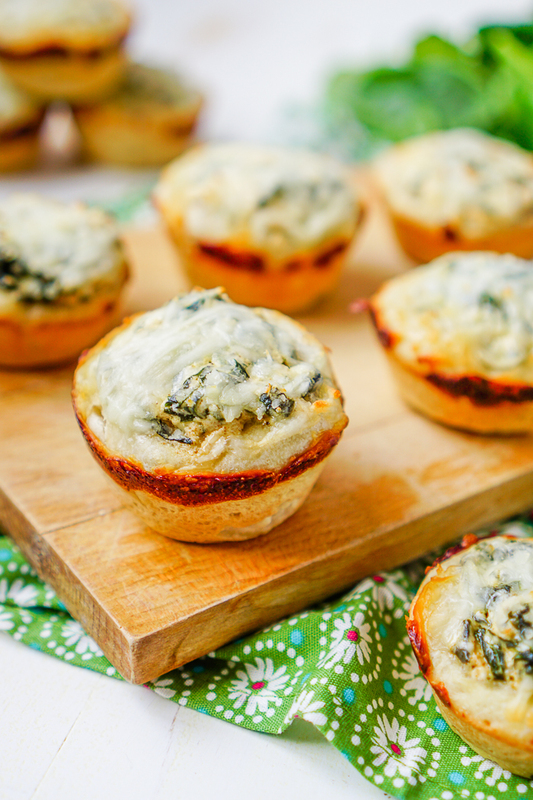 Now, Let’s Bake Up these Individual Bread Bowls with Cheesy Spinach Dip Filling! It doesn't get much better than deliciously cheesy spinach dip stuffed inside warm french bread! These Individual Spinach Dip Bread Bowls make great party food and holiday appetizers! Unroll the french bread loaf and slice into 10 equal size slices. Flatten each slice into about a 3 in round circle by pressing between your hands and/or carefully pulling. This is easier to do if it's closer to room temperature. Spray 10 regular muffin cups with non stick cooking spray and press your bread slices into the bottom and up sides of the muffin cup. Set aside. Heat oil in skillet over medium heat. Add spinach and cook until slightly wilted; this should only take a few minutes. Then, add garlic and stir for another minute. Place cream cheese, sour cream, cooked spinach, and the rest of the ingredients (minus part of the mozzarella you have saved for the topping) into a medium bowl. Mix until well combined. With a cookie scoop or a spoon, scoop dip into each of the centers of bread bowls. Top evenly with remaining mozzarella. Bake for 15-17 minutes until they begin to turn a nice golden brown on the edges. Remove and let cool for 3-5 minutes. NOTE: Depending on how full you like these muffins, you may have enough filling for another roll of french bread. Increasing sour cream to 1/2 cup and adding 1/2 cup more of spinach would help stretch the mixture well. I love spinach dip, and these look so yummy! I love that you can just pick them up and eat them. Such a good idea! Wow, that looks absolutely amazing. This is one of the most unique ideas I have seen in a while. Why have I not seen this before? I have a birthday party coming up for the baby, maybe I can make this as a treat for the adults? I’m gong to have to try!